Back Issue #96 ships today! 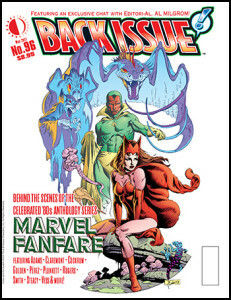 Go behind-the-scenes of 1980s MARVEL FANFARE in BACK ISSUE #96! It features an exclusive chat with Editori-Al himself, Al Milgrom. Plus it includes interviews with and art by Arthur Adams, Chris Claremont, Dave Cockrum, Steve Englehart, Michael Golden, Roger McKenzie, Frank Miller, Doug Moench, Ann Nocenti, George Pérez, Marshall Rogers, Paul Smith, Ken Steacy, Charles Vess, and many more! As always, it’s edited by the amazing Michael Eury. You can view a free preview and order the Print Edition HERE! This entry was posted in TNT on 2 May 2017 by Mr. Morrow.